By now we all know that sitting for eight hours a day at a desk is bad for you. However, not everyone fully understands that standing in one position for eight hours a day at a desk, all day, every day, is also bad for you. It is. There’s an easy solution, though. You simply need to spend part of your day standing and part of your day sitting. And in both positions, the key is to constantly vary your movements throughout the day. Using one of these three “standing stools,” designed for use at a standing desk, at least for some part of the day, is a great way to accomplish that. They require more active participation than a traditional office chair and they also force you to maintain better posture during the time you spend sitting. 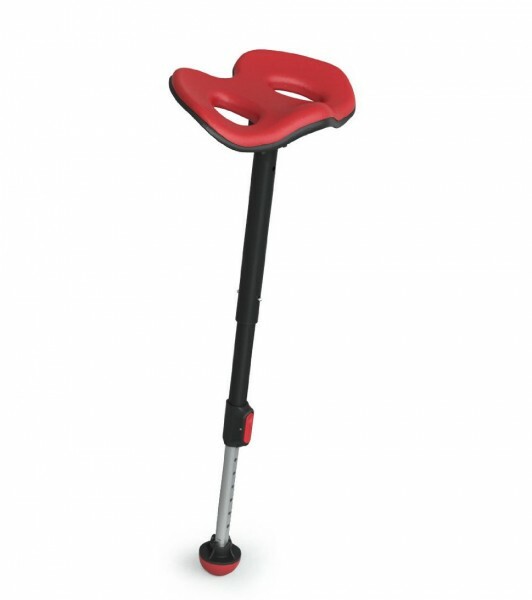 The Mogo Stool, designed by Martin Keen, the founder of Keen footwear, was dubbed the Human Kickstand by beta testers of the product and it really does look like one. Designed to be portable, it is collapsible, weighing in at just two pounds, and can be carried in a tote bag or attached to a backpack. Focal Upright suggests that you not only use it at your standing desk but also outside, at events like soccer games. As you can probably tell from one look at the peg-like base, the Mogo Stool was designed for leaning, not for traditional sitting. This helps align the pelvis and spine to create a neutral, natural position. The company recently added more cushioning to the seat, which does look a little uncomfortable. With a height range of 18″ to 37″, it has the greatest range of the three standing stools featured here. 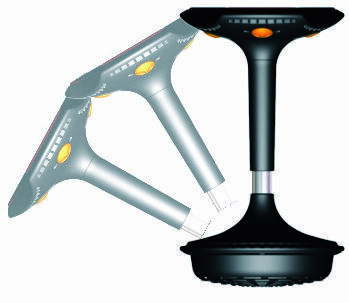 The Mogo Stool will work for people up to 6’2″ in height, as long as they weigh 200 pounds or less. Amazon sells it for $125.00. Featuring a rounded triangular saddle seat, the Wobble Stool pivots 360 degrees and can be adjusted for height (between 23″ and 33″) at the touch of one of three buttons located underneath the base of the seat. This company, too, has recently added extra cushioning to the seat, which suggests to us that the comfort of the padding of the seat is something to pay close attention to when making a purchasing decision about standing stools. Amazon sells the Wobble Stool for $189.00. 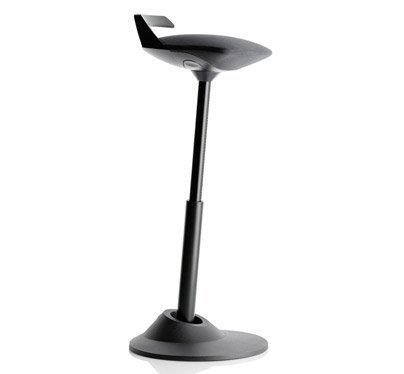 At the high end, the Muvman Sit-Stand Stool is more attractive than the other two choices shown here. Designed by a German company, the stool blends in nicely in almost any modern décor and, in fact, it won the prestigious RedDot design award in 2011. As you might expect from a more expensive product, the Muvman is more customizable than the other two options featured here. The seat itself can be used in the traditional flat front position or it can be turned 45 degrees and used as a saddle seat. The standard stool’s height can be adjusted from 20″ to 33″, but then the stool also comes in a tall option, with a range of 23.5″ to 36″. This is great, because, for whatever reason, it seems that a lot of standing desk users are well over 6′ tall. Furthermore, with the aid of a “dynamic strut,” the cushioned seat maintains a forward tilt of 4 degrees, for an “active, supported standing position,” according to the company. This position keeps your pelvis upright and your spine in its natural S shape. Of course, all these extra features end up costing you a little or, depending on your perspective, a lot more. Amazon retails the Muvman for $599.00. There you have it. Three good options for standing stools for your standing desk. Choose any one of them and you can feel great about sitting for at least part of the day. And you’re sure to spark your office mates’ interest with one of these unusual seats, too. If you’re uncomfortable with the space-age look of these standing stools, though, Amazon has plenty of options that look much more traditional. We just can’t guarantee they’ll be as much fun!